This year we visited the Grand Canyon of the Colorado River, a place which gets about 4.5 million visitors a year. Most of these visitors never descend into the canyon and until a century and a half ago, most of the canyon had never been traveled by anyone. Indians of the area descended into the canyon and even farmed and lived there in certain areas, but they were not able to and did not travel along the bottom of the canyon for any distance. Travel at the time was in and out of the canyon but not along the canyon. 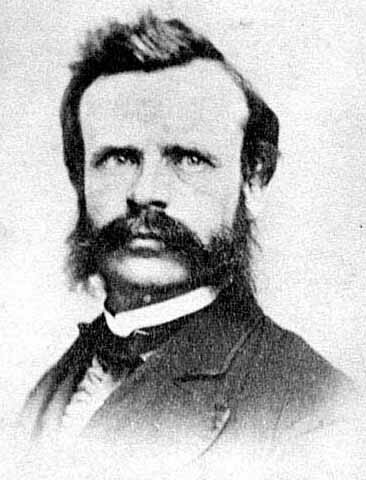 John Wesley Powell changed all that. 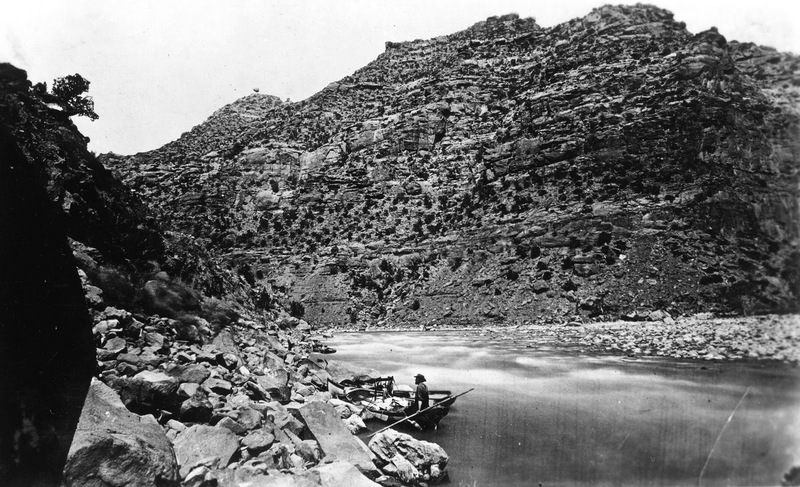 The American Civil War had just ended and Powell who had been a Major in the Union Army organized an expedition to explore the Colorado River and its tributaries. The US was still relatively young. 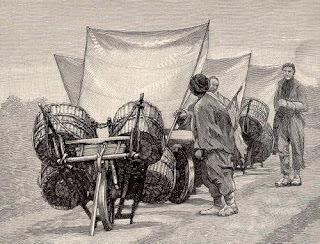 Americans were still moving west and if the movement west was going to go forward in earnest then transportation routes were needed, not only to bring people into the region but also to export resources out of the region. Major Powell was the man to find those transportation routes. I knew the basics of Powell's story but after my own trip to the Grand Canyon, I pulled Powell's report of his journey off my book shelf where it had sat unread by me for a number of decades. It was time to upgrade my knowledge of this piece of Western history. I have not finished Powell's book so this is an incomplete report, but this being a boat related blog, I will focus on Powell's means of transportation, that is, wooden row boats. 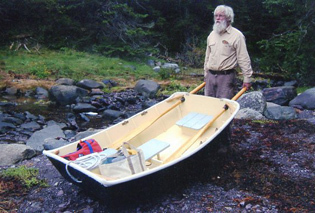 Powells boats with one or two exceptions were 20 feet long, made of wood with extra frames added for strength. The front and back ends were decked over and closed off to form water-tight compartments in which food and gear were stowed. The journey began on a tributary of the Colorado river in territory where the canyons were not yet as imposing as farther down the river. The expedition's first camp is shown here. Notably absent from the picture is any kind of plastic, a substance without which modern camping and river travel would be unimaginable. 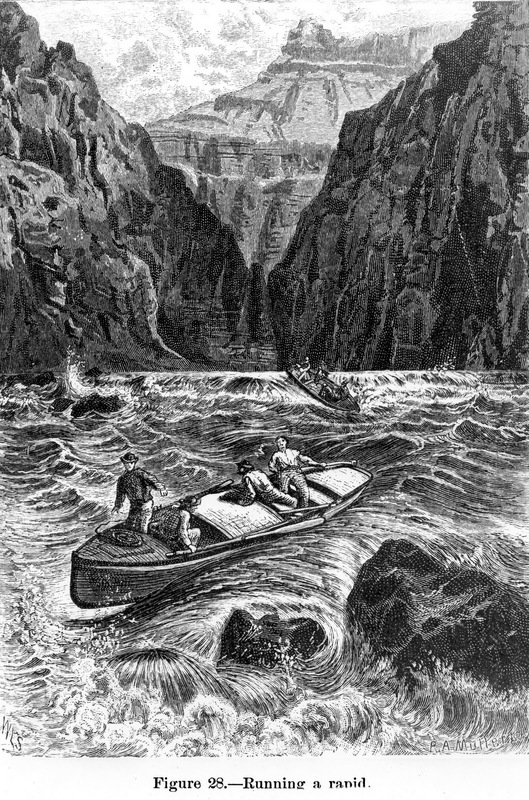 As the journey progressed, the canyons became deeper and the expedition encountered falls and rapids. The picture above shows one of the options for dealing with rapids, that is, to run them. Other options for dealing with rapids were lining the boats down the rapids and portaging. In either case, the usual method was to assemble the boats on shore at the head of the rapids and secure them while scouting the rapids. Where possible, the boats were lined, that is, led down the rapids with lines tied to both ends of the boats. If the rapids were too severe the boats needed to be unloaded, the gear carried to the bottom of the rapids and then the boats. All this took time and lots of work. 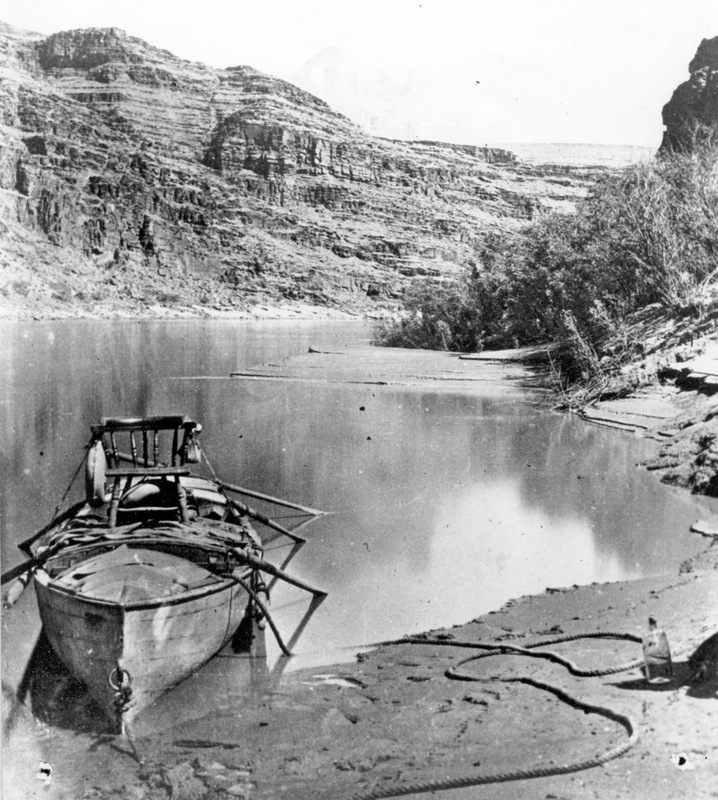 Powell and his crew explored new territory and also inadvertently invented a new sport: river running. This sounds like not that big a deal since totally inexperienced travelers now do this trip every year albeit with experienced guides. 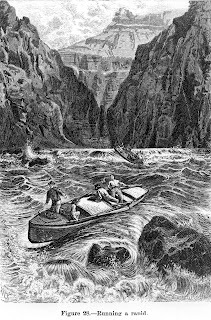 But what made it different for Powell and his crew was that none of them knew whether their boats would survive the rapids or what the severity of the rapids would be. 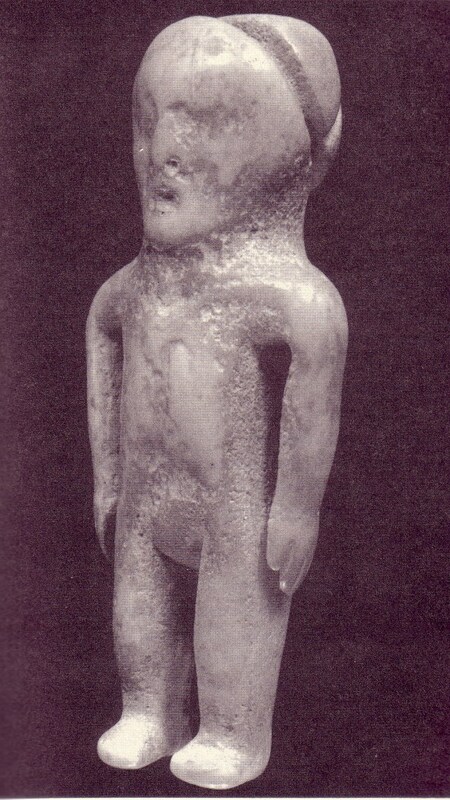 They also lacked modern gear and were cut off from civilization for most of the trip. 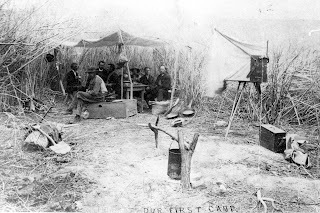 Conditions were sufficiently horrid to make some of the men quit. Photos are from the National Park Service site. 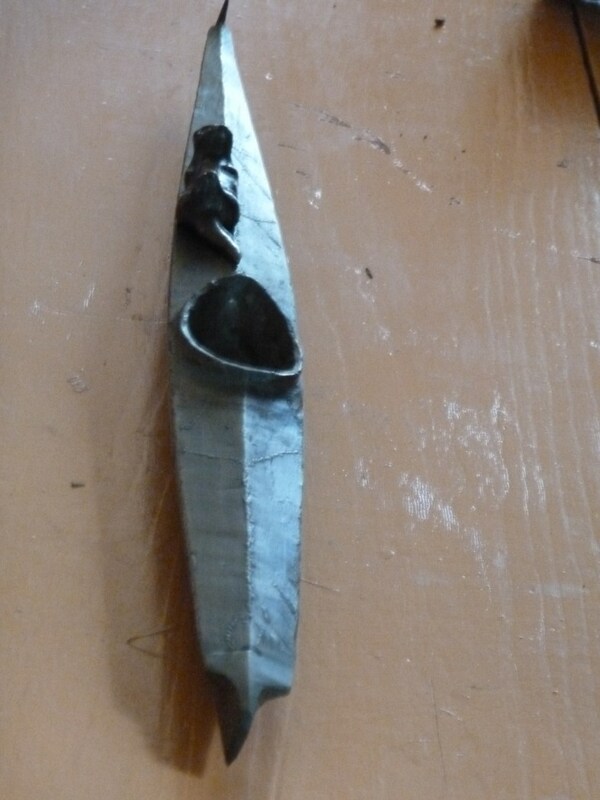 A few years ago, a friend of mine gave me a bronze model of an Unangan kayak. This year, my wife gave me a bronze sea otter. Coincidentally, or perhaps not, the sea otter was made to roughly the same scale as the kayak and so I put the sea otter on the deck of the kayak where it looks nice and appropriate and also cute. The notion of a sea otter on the deck of an Unangan kayak is mostly a fantasy. 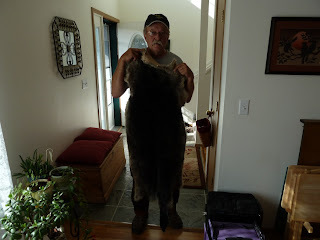 Sea otters were hunted by Unangan men in the service of the Russian fur traders aka promyshlenniki and later under American rule until the hunt was outlawed in 1911. 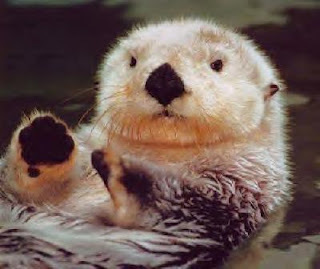 Apparently, it dawned on somebody in the government that sea otters were near extinction. 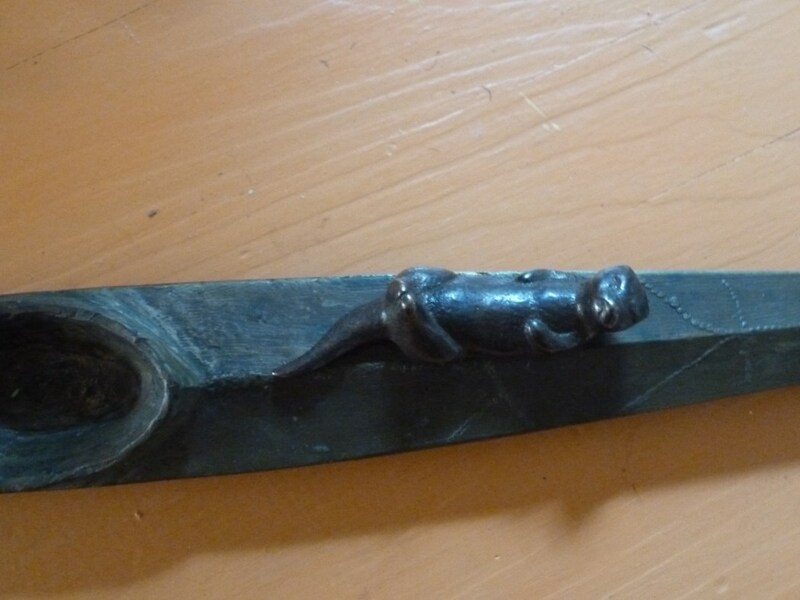 So, perhaps coincidentally, the sculptural assemblage of kayak and sea otter is a belated celebration of the one hundred year anniversary of the cessation of the sea otter hunt. To modern urban sensibilities, the notion of hunting sea otters is abhorrent since they are so indisputably cute even as full grown adults. But sea otters were hunted for practical reasons, that is, for money that the Chinese were willing to pay for their fur. The Chinese needed the fur for their aristocracy which needed the luxuriant fur to trim their aristocratic robes as shown above. 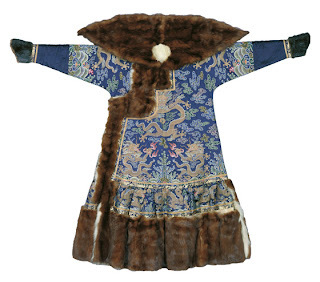 The fur, when not attached to an imperial Chinese robe looks like the above. Legal note: Only Alaskan Natives may possess sea mammal furs in the raw. Non-natives may possess art or crafts objects that incorporate sea mammal parts if created by natives. 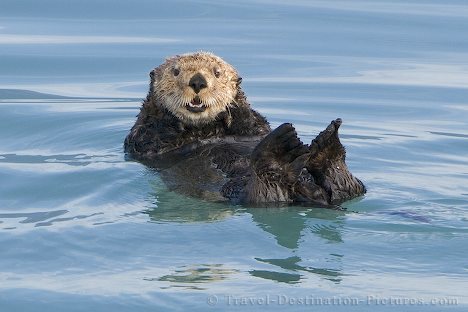 The Spanish in America, specifically in Baja and Alta California, received mercury in payment from the Chinese for sea otter furs. The mercury was then used to extract gold from ore and the gold was shipped back to Spain to finance wars against other European nations. And so it goes. Sea otters are safe for the time being. Oil has been found to be much more vital to economic well-being than mercury or gold. If you've read any survival handbooks, you're probably aware that they are not written with the notion of survival becoming a way of life. Survival handbooks assume that due to some accident, you find yourself temporarily isolated from civilization and in need of food, shelter and water. And while you're waiting for the search and rescue team to come and get you out of the pickle you find yourself in, you'd like to stay alive. Let's assume that you find yourself in a reasonably warm place with water. You probably don't have to do much of anything to stay alive. Drink the water and find something to distract you while you're waiting to be rescued. If you have shelter and water, you can probably get by without eating for a week or more. If there is wild food to be had, collecting and preparing it is probably as good a thing as any to keep you occupied until the helicopter shows up. But the notion of long term survival in an unfamiliar place is an optimistic one. Let me give my reasons. To stay alive anywhere, you need a good deal of knowledge about the place you are in and the support of your community. If you are lost in the wilderness, chances are, you don't know anything about it and you lack the support of a community. Even if wild food is plentiful and you can recognize it, long term survival depends on knowing how to prepare the food and preserve it for times when it isn't plentiful. A good deal of native knowledge consists not only of what plants and animals are good to eat and how to collect them, but also how to process and preserve them and store them against times of scarcity.